The drama -- and mysteries -- of UFC 168's main event is starting to boil over. On Saturday night, when it’s time to make the walk for the UFC 168 main event, Anderson Silva will strut out to the Octagon first. The last time he did so, he was something of an unknown commodity. He had already decimated Chris Leben in his UFC debut, but there was still some doubt about how he well he would perform against the UFC’s elite after arriving from the international leagues. He would go on to crush Rich Franklin and become the vanguard, but back then, there were mostly questions about him. It’s the same now. While the odds for his headliner with Chris Weidman remain in Silva’s favor, they are easily the narrowest he’s seen since facing Dan Henderson in 2008. That suggests that a strong subset of fans and observers believe that the Silva dynasty is over, and that Weidman represents the new guard. Still, the fact that he’s the betting favorite is no small thing. It’s very rare when the champion is the underdog, and this is coming off an emphatic knockout. It was the circumstances of the first fight which has left so much doubt about the middleweight championship rematch. In just six minutes and 18 seconds, there was so much psychological and athletic interplay between the two that we can’t seem to agree on whether Weidman deserves all the credit for his finish, if Silva deserves all the blame for his approach, or if (more likely) the truth lies somewhere toward the middle. As for the future? It’s all guesswork, but here are the questions that make Weidman-Silva II so compelling. 1. Was Silva really "tired" of defending the belt? 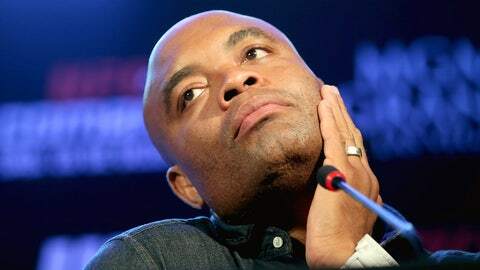 Will Anderson Silva be bored on Dec. 28? It’s the quote that gave rise to the whole notion that Silva wasn’t really himself on fight night. In the seconds after losing, he told Joe Rogan that he was "tired" of fighting for the highest possible stakes. Yet less than six months later, here he is with another huge spotlight on him. It’s true that given Silva’s pride, this fight should have more personal meaning to him than some of the title defenses that were probably becoming somewhat monotonous. Yet, on the other hand, training camp mostly consists of a lot of routine drilling and sparring, and how excited could he have been for that grind? Only Silva knows if he approached things differently this time around, and if he’s truly excited to solve Weidman. 2. Did we see the best Weidman? Is ‘The All-American’ getting better with each day? Much has been made of Silva’s playful, almost disinterested performance on fight night, but what about Weidman? After just nine pro fights and three years experience, he was fighting the G.O.A.T. It’s impossible to think he wouldn’t have been hit by a case of nerves. And as any fighter will tell you, that quickly burns fuel. We might have seen some of that as he slowed down to start the second round. It was an entirely new experience for him, and it was at that point where most figured the momentum would quickly swing Silva’s way, but instead, not only did Weidman survive, but he won via finish. This time around, he has that experience under his belt, so he’ll be more comfortable, and should have an easier time keeping his gas tank full. So it’s certainly within reason that he’ll have any even better performance in the rematch. Just how iron is that chin? 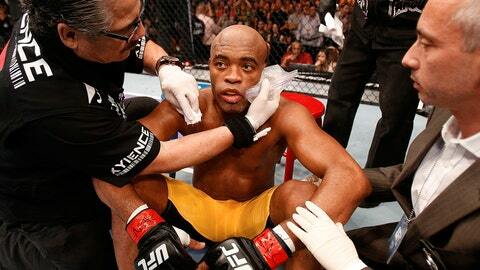 For most of his career, Anderson Silva has been vaunted for his iron chin. That’s one of the reasons he’s always felt comfortable dropping his hands and inviting his opponent to fire away on him. But it’s not a sure thing anymore. It’s not just anecdotal evidence that tells us that aging fighters can’t take a punch like they used to; there’s statistics to back up that claim. In the new book "Fightnomics," Reed Kuhn reports that UFC fighters who are 36-38 years old get knocked out at nearly twice the rate of fighters aged 22-23. Silva is 38, and while he still physically looked like himself in the Weidman fight, he’s less likely to eat a power punch than he used to be a few years ago. That means the odds of a repeat are greater than you might think. Recently, Silva did an interview in which he said it wasn’t his clowning that was the issue; it was that he did not follow-up with offense. While it’s true that one cannot win a fight without offense, Silva’s take presupposes that he can let his strikes go without fear of Weidman putting him on his back. 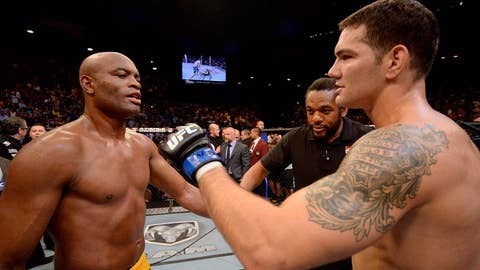 Weidman is a strong takedown artist (67 percent accuracy) and is excellent on the ground, and Silva felt a small taste of that in the first round. In the second he implored Weidman to stand up with him. But he was mostly content counter-striking rather than leading. Perhaps that’s because he knew that getting carried away while coming forward could end up with him on his back, and Weidman is far more dangerous than any of Silva’s recent opponents from that top position. In one strange sense, Silva got the better of Weidman in fight one. He taunted the New Yorker into playing the standup game, and Weidman obliged him, later acknowledging that Silva’s provocations convinced him to temporarily abandon his game plan. It turned out well the first time around, but if Weidman lets his emotion get away from him again, will he be so fortunate a second time out? As previously mentioned, older fighters can’t take strikes as well as younger ones, but Silva still has marvelous striking skills, and is certainly capable of landing a fight-changer before he takes any significant strikes. This cat-and-mouse game is one to watch. Will this be the end of the Anderson era? Or the beginning of Weidman’s? Here’s an interesting question: Is this fight bigger for Silva or Weidman? True, Silva’s legacy is secure, but he has the chance to add an incredible new chapter. How many champions can recapture past glories at the age of 38? Muhammad Ali never won after reaching that age. Neither did Mike Tyson or Chuck Liddell. Fedor Emelianenko was out of fighting by that time. Silva has the chance to avenge a defeat and become a two-time champ at an age where most former titleholders are done. For Weidman, it’s the chance to prove that nothing about the first time around was fluky. There’s a reason why he’s still seen as the underdog by the majority, and it’s not because people don’t respect his skills. It’s because they believe Silva is still the division’s best. On Saturday night, he can change that opinion for good.